The perfect country house . . . a stunning English treasure | A balanced diet . . . Standing in 1300 acres on the northern outskirts of Grantham in Lincolnshire, Belton House must be one of the National Trust’s jewels, though perhaps not quite on the same scale as either Waddesdon Manor or Kingston Lacy. 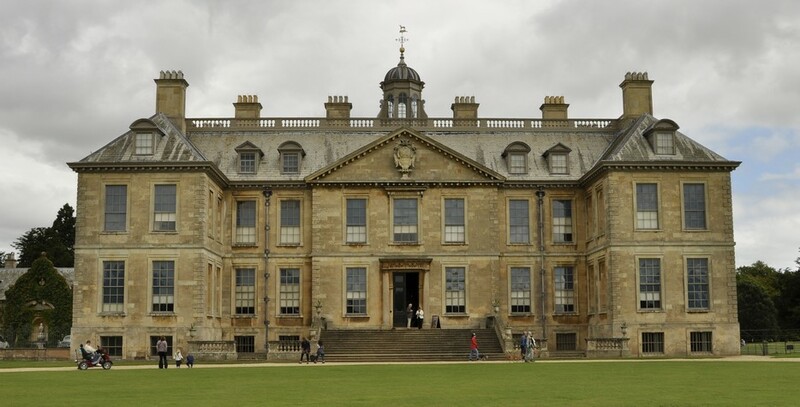 Built in the 1680s for Sir John Brownlow, Belton House is an elegant Restoration mansion that retains much of its original structure externally, but which has been remodelled from time-to-time internally over the past 300 years to meet changing demands for its occupancy. English architect James Wyatt had a major influence on the redesign of parts of Belton House in the late 18th century, as he did on many country houses. The Brownlow fortune came from sheep and wool and, like may wealthy families, the construction of a large home was a sine qua non. 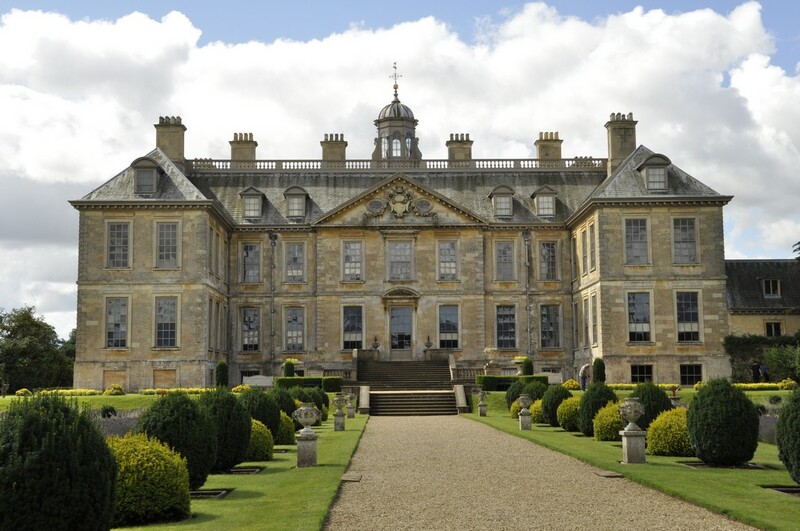 Belton House remained the family seat of the Brownlow and Cust families into the 1980s. We visited Belton House last Friday. Since we became members in 2011, we have ‘picked all the low-hanging fruit’, more or less (visiting most if not all properties within 50 miles or so of home), so must now travel further afield as active (and enthusiastic) ‘Trusters’. 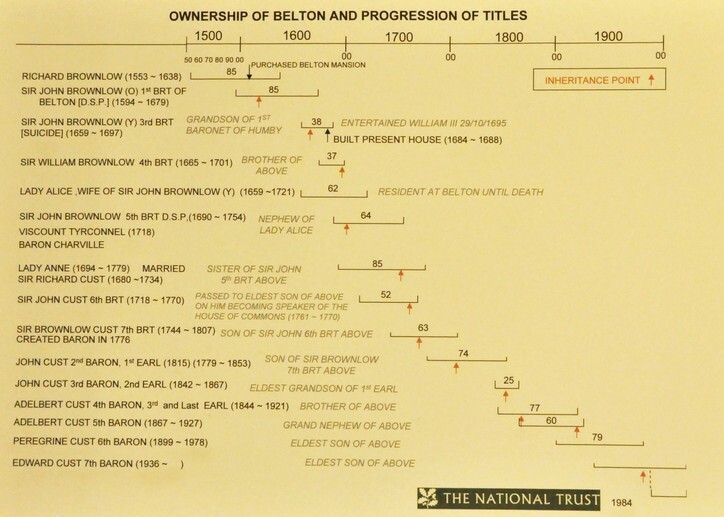 Belton House is almost exactly 100 miles from home, door-to-door. The ‘best’ route (A38-M42-M6-M69-A46-A52-A607) on Google Maps indicated a journey of about 1 hr 40 minutes. And that’s how long it took (although somewhat slower on the return journey after 2:30 pm as the Friday afternoon traffic picked up). 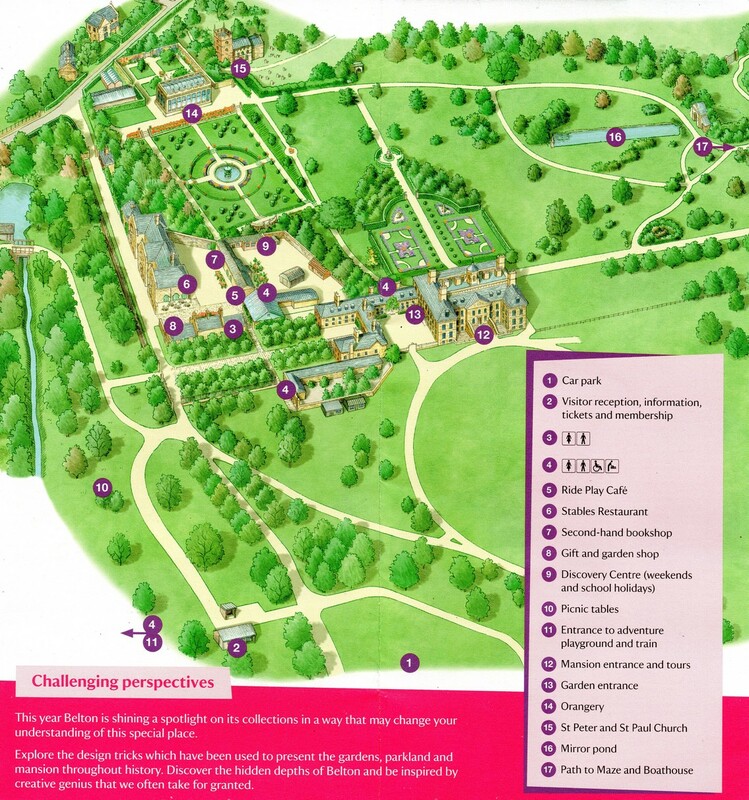 Belton has much to offer: the house itself, formal gardens, long walks through the park, and one of the Trust’s largest adventure playgrounds for children. No wonder the car park was quite full when we arrived before 11 am, and filled up even further by mid-afternoon. Not being entirely sure of the weather on Friday (fortunately it remained dry although did become quite overcast for a while around noon), we decided to take in the gardens and the grounds close to the house as far as the Boathouse, Lake and Maze (17 on the map below). The Boathouse was built in the 1820s in a Swiss chalet style. From a distance the walls appear to be made from woven panels of rushes or the like. But no, the walls are solid with a sculpted surface to resemble panels. A short distance from the east face of the house is the Mirror Pond (16), from which the house can be seen in all its glory, and reflected in the Pond. A small maze offers a challenge to many of Belton’s younger (and older) visitors. To the east of the house a long avenue of trees draws you towards a rather high ha-ha, and beyond that more parkland rises to Belmont Tower a further mile out. From the house’s main entrance there is also a mile-long drive through a deer park leading up to the front door. How magnificent it must have been to arrive by horse-drawn carriage and met by footmen. The views are stunning but of course we are seeing the parkland today as the house architects envisioned them three centuries ago, with majestic mature trees spread across the landscape. On the north side of the house there are two formal gardens: a 19th century parterre, and another with pond and fountain laid out in front of a very impressive Orangery (14). Much of the house is open to the public. We opted not to take the below stairs tour, which lasted 50 minutes. First, given the long journey home, we wanted to maximise our viewing of the main parts of the house. Second, a tour of this type would probably have involved standing around as the tour guide described each room; since I broke my leg at the beginning of 2016, I no longer find standing still comfortable . All rooms on Upper Ground Floor are open to the public. Not particularly large by some country house standards, the Marble Hall is elegantly proportioned, with an array of portraits on the walls, and fine ceramics around the perimeter. On the east wall is a large portrait of Sir John Cust, 3rd Bt (1718-1770) who was twice Speaker of the House of Commons. A couple of portraits have fine wood carving surrounds, reminiscent of the work of Grinling Gibbons (d. 1721) to whom some of this work has been attributed. We first saw his exquisite work during our visit to Sudbury Hall earlier this year. What an elegant staircase, climbing in three sweeps to the first floor. 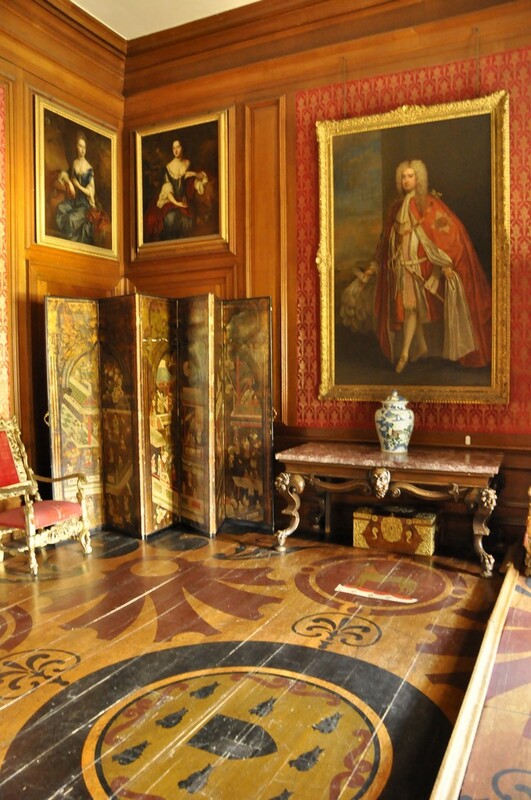 It’s lined with some fine portraits, and overlooks a black and white marbled floor, a continuation from the Marble Hall. Adjacent to the Blue Bedroom, this small room has some interesting treasures: a whole array of paintings, including the one shown here which portrays the Madonna and Child, attributed to Italian painter Pier Francesco Fiorentino from the 15th century. Behind the door is a cabinet made from lapis lazuli. And some intricate and very beautiful carving on the fireplace surround. This is the oldest bed in the house, and has a fine view over the parkland and main entrance driveway from the south. In the Drawing Room hand two fine 17th century tapestries by Huguenot weaver John Vanderbank, modelled on tapestries owned by Queen Mary II at Kensington Palace. The Saloon has views over the parterre garden on the north side, and has several interesting features, paintings, and pieces of furniture. This room has undergone a number of changes over the centuries. This is an impressive portrait of Viscount Tyrconnel (1690-1754) wearing his robes as a Knight of the Order of the Bath. The wide floorboards show the Brownlow coat of arms. This room was rather dimly lit (although these poor quality photos don’t show that). What caught my fancy in the Study were the gold busts lining the top of the west wall. This is, in my opinion, undoubtedly the most elegant room in the whole house, and has undergone several changes of use over the centuries. It’s warm, intimate, inviting, and lined with tapestries that, at one time, were found in the attic rooms being used as carpets! The tapestries depict the life of ancient Greek philosopher Diogenes. One can imagine enjoying a welcome gin and tonic in this room at the end of stressful day. On the piano is a photograph of the Duke of Windsor and Wallis Simpson (it looks like one’s I’ve seen from their wedding in 1937. The Duke certainly spent time at Belton. It’s not certain if Wallis did. There are 20th century portraits of the Cust family in this room. Swans seem to be a theme in this room which became a dining room in 1876. The large canvasses by 17th century painter Melchior d’Hondecoeter were installed then. A larger canvas was sold to a buyer in the USA as it did not fit in this room. The fireplace came from another family property. 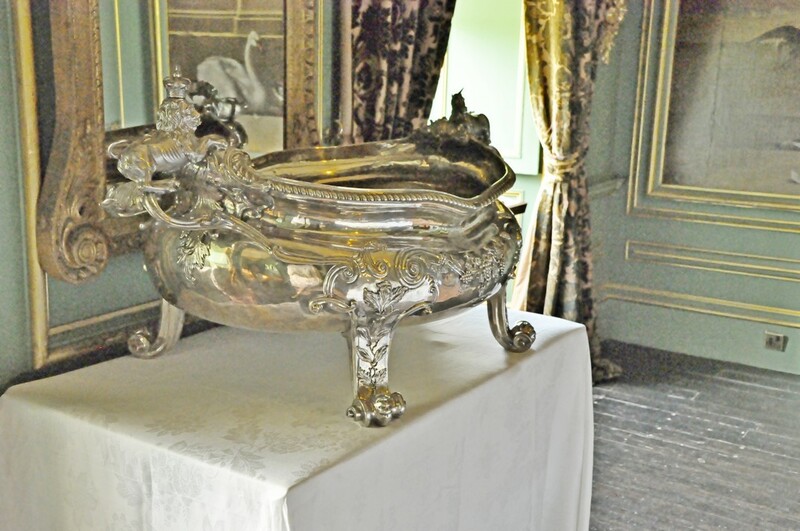 On a table by the window, overlooking the parterre, is a large vessel (a soup tureen, a wine cooler?) made from more than 41 kg of solid silver. It was commissioned by Speaker Cust, referred to earlier. He died, however, before the vessel was completed. 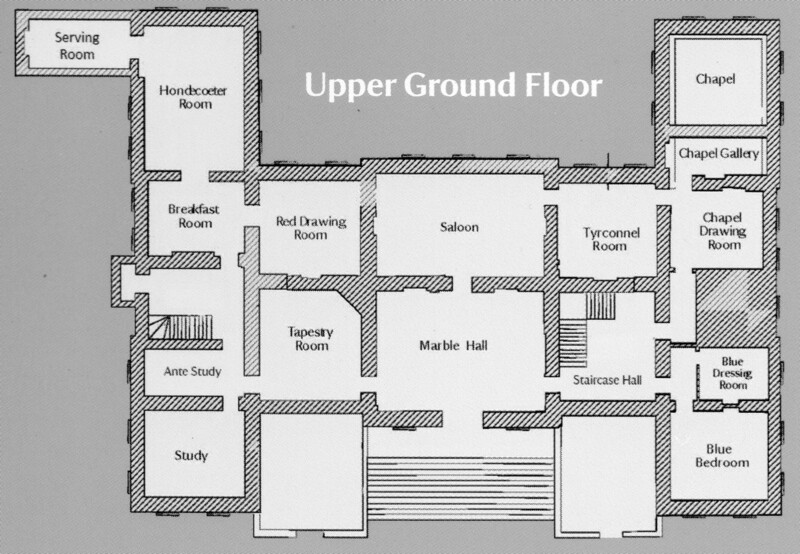 On the First Floor, some apartments are still reserved for the Cust family if they care to visit, and therefore not open to the public. The Cretonne Bedroom was closed as well. The Yellow Bedroom is immediately above the Blue Bedroom, and also benefited from structural changes that James Wyatt made, bricking up windows on the east and west walls, leaving just the windows overlooking the south landscape. You can see how these changes were made on the photograph below, on the farthest side of the house. This is a quirky room, with 18th century wallpaper designed specifically for the room, but apparently not hung until about 1840. The bamboo door surrounds are painted not made from bamboo. 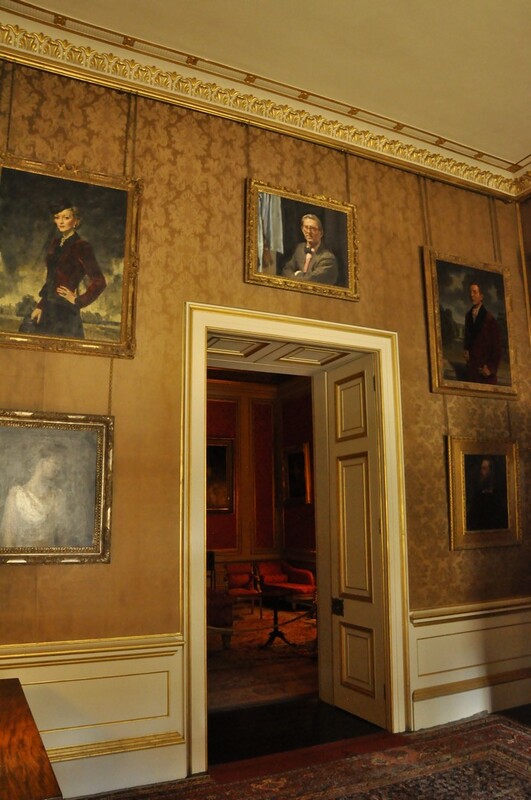 This room was redecorated in 1840 for the visit of Queen Adelaide, widow of King William IV, and has been known as the Queen’s Bedroom ever since. Her monogram adorns the bed’s headboard. The Library is approached from one side from an Ante Library, and from the main staircase on the other. It has a domed ceiling. High on the walls at either end of the Library are ‘frescoes’ painted by daughters of the Cust family. The one shown here was painted by younger daughter Lucy Cust (bn. 1784). This was originally a bedroom but in the 1770s was remodeled by James Wyatt as a dressing room. Only some of Wyatt’s designs remain (such as the ceiling). Its presence design and use dates from 1963. I suppose the claim to fame of this bedroom is that it was used by HRH The Prince of Wales while undergoing jet aircraft training at nearby RAF Cranwell in 1971. He apparently preferred to stay at Belton House than in the officers’ mess at Cranwell. 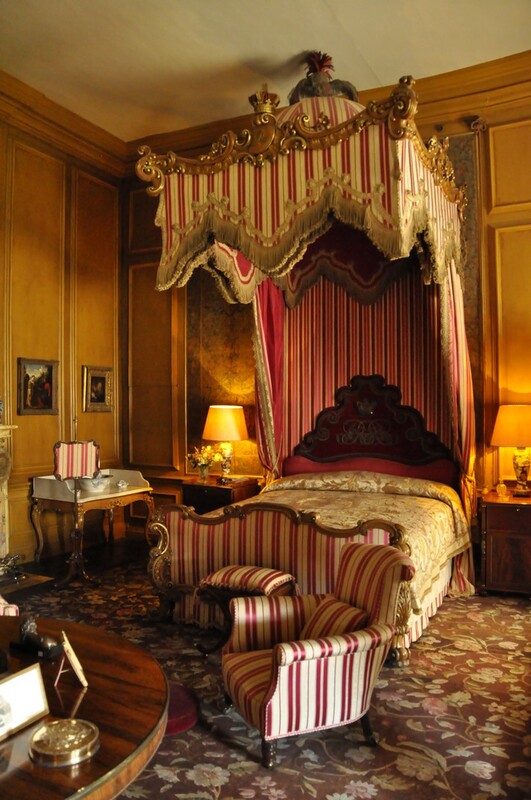 Maybe this room was also used by the Duke of Windsor, presumably when he was still Prince of Wales. Or did he visit as Edward VIII? Not as grand as the main staircase, this one is nevertheless quite impressive. It was originally used just by servants, but in 1810, the 1st Earl made the west entrance into the family entrance. The large painting shows the Cust family in 1741. 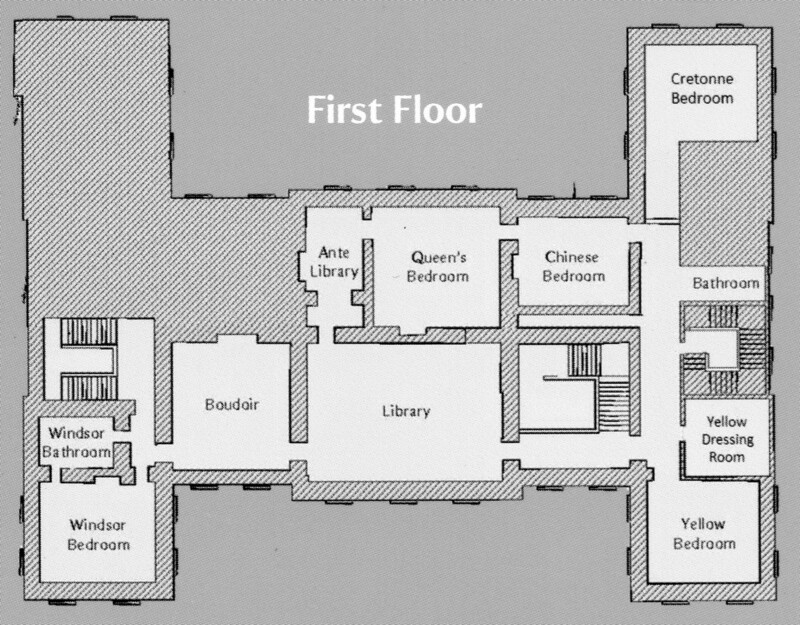 You can see the West Entrance (opening into a courtyard) in the house photograph under the Yellow Bedroom (above). Belton House certainly has a lot to offer with its mix of indoor and outdoor interests. The National Trust volunteers were very knowledgeable and freely shared intriguing details of the house’s history. For a day trip, four hours on the road, just under four hours at Belton, it was quite tiring. And I was quite relieved to arrive home and enjoy a late afternoon cup of tea. But as I mentioned from the outset, we will now have to travel further and further afield to visit new properties, and probably plan for several overnight stays into the bargain. 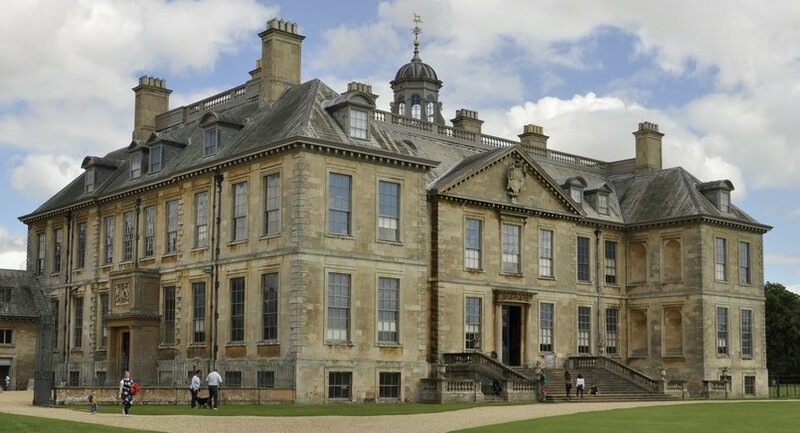 Put Belton House on your National Trust ‘bucket list’! This entry was posted in Out and about and tagged Belton House, Lincolnshire, National Trust.